So while making a high voltage divider to use with a multimeter I decided to test it with a 15kV 30mA NST. What I did is hook the divider to one of the terminals and the other end to the NST's ground – voltmeter read 0.8 volts AC, which means around 8,000V. While it isn't super accurate (it was calibrated with a 150VAC source), it is close to what I expected. However, when I tested the output after the full wave rectifier the voltmeter only read 0.06 volts DC. This can't be, after all, I should expect at least a thousand volts (at least) and 0.06V on the meter is just 600V. So to see if my rectifier is the problem, I connected only one of the 2 terminals (2 diodes) and now the voltmeter read 0.4 volts DC, which would be 4,000V. Does this indicate my rectifier is damaged or could my error source be somewhere else? Diodes are made in the USA and are rated for 15kV 100mA and 100nS https://www.deantechnology.com/products/2cl2fl, both were soldered together so that the grey strip (cathode) was pointing to the outside in both of them, to prevent overheat/arcing the rectifier was placed under mineral oil in a PVC pipe. Pablo, this is sort of a New User Chat Area topic. Can you show us a diagram (even an ASCII schematic) of your experimental rectifier connections? In a 2-diode full wave rectifier with NST center tap = ground, the diodes will be subjected to more than 21,000 volts of reverse bias in each AC cycle. I know there are FAQs saying MWO diodes are OK, but that's a Tesla coiler's perspective -- it is OK to abuse electronic components if your friends and competitors are getting away with it. Suppose there's 15 kV AC between the two hot terminals. Each terminal has 7.5 kV AC with respect to ground. That's RMS, so the peak voltages are about -10.5 kV and +10.5 KV. We set up a full-wave center-tapped rectifier circuit, for negative output as you described. When terminal 1 and rectifier output are at -10.5 kV, terminal 2 is at +10.5 kV, so the terminal 2 diode has 21 kV of reverse bias on it. At peak of the next half cycle, terminal 2 and rectifier output are at -10.5 kV, and now the terminal 1 diode needs to withstand 21 kV. Also note: if the diodes are OK, and the output waveshape is a rectified sinusoid, a DC voltmeter will indicate about 90% of the unrectified RMS voltage. With 7.5 kV RMS (AC on each NST terminal), the output peaks will be about 10.5 kV and the DC average will be less than 7 kV. Can you test your rectifier now with 120 or 240 volts, and see if it's still functional? Can you test it with NST on a variac (not a solid state light dimmer or motor speed reducer)? Diode breakdown from too much reverse voltage won't instantly destroy the part -- current would be limited by the NST -- but don't get your hopes too high. Last edited by Rich Feldman on Wed Feb 13, 2019 1:30 am, edited 1 time in total. In my case, I did use the center tap as the ground for the full wave rectifier (not half wave, as the picture incorrectly says) and the voltage divider. But with the 15kV transformer I have, each terminal gets a maximum of 7500V right? so when terminal 1 is +7500V terminal 2 is -7500V. I do have a variac that maxes at 150V and max current is 20A. However, because it doesn't have a center tap then the rectifier will just do half wave, right? The diagram is correct for full wave rectification. The output peak will be nearly -10kv on the cathode. The transformer's case ground is the center tap of the 15kv winding this is why at both the negative peak on one knob or insulator you get half the RMS voltage to be rectified on each alternation of the AC waveform, thus full wave rectification. No variac has a center tap. The better ones do have any number of extra taps on the windings for special hookups, but never a center tap. The extra taps are often used to boost the output over the line voltage or to allow the control wiper knob to work normally from front or back of the variac. The normal knob is at zero when all the way counter clockwise and turning it clockwise raises the voltage. Multi-taped Variacs can reverse this direction. A bit of electrical know-how is needed to make use of the tapped variacs in all manner of situations. The simplest variacs only have three terminals, one at each end of the winding and the wiper terminal. Boosting variacs can have 4 or 5 terminals. I have seen and worked with 7 terminal variacs which are rather rare. You are entered into the Plasma Club. >>But with the 15kV transformer I have, each terminal gets a maximum of 7500V right? so when terminal 1 is +7500V terminal 2 is -7500V. My own measurements of NST's confirm that primary and secondary voltages are given as RMS values, just like most other transformers. Unlike x-ray transformers, whose nominal secondary voltage is the peak value ( kVp ), for a good reason in radiography. from http://www.learningaboutelectronics.com ... lained.php, found using Internet search. Thanks, Richard. I was asking about the variac because I didn't understand what was meant by Rich "Can you test your rectifier now with 120 or 240 volts, and see if it's still functional? [with the variac]". Rich thanks for the info, you are right! So today I removed the diodes from the PVC pipe and they didn't look good. So what I did is take 2 new 15kV diodes and put them on a 3/4" plywood board. I made the rectifier in the same way as before (diagram) but this time it was exposed to air. 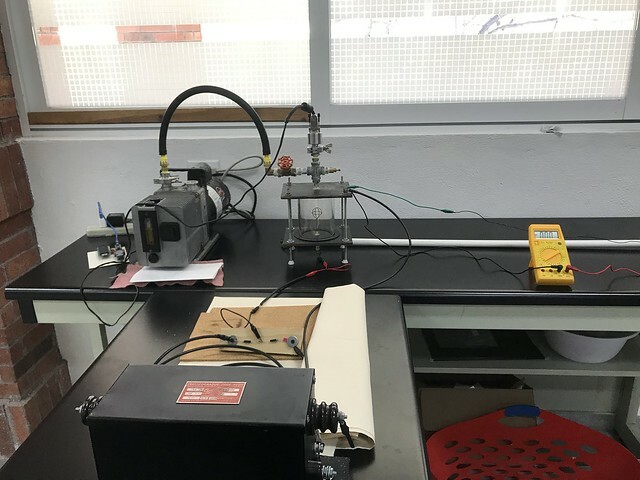 Measured the variac at 40V and then connected the NST with its newly made rectifier. HV divider meter measured 0.3 or 0.2V, I can't recall, however, this was looking good as it meant around 3,000 volts. I decided to max a bit of the variac's input and got readings of 0.8 and 0.9V dc at the HV divider. By now it was obvious I had fried my past diodes, also it is worth mentioning that when the divider read 0.8V there was a lot of arcing in the diodes. On another hand, today mi vacuum system reached 50microns so I decided to test it. Now I could only get around 0.3V (3000v) on the meter when the demo fusor was running but I could still hear and see the arcing in the diodes. 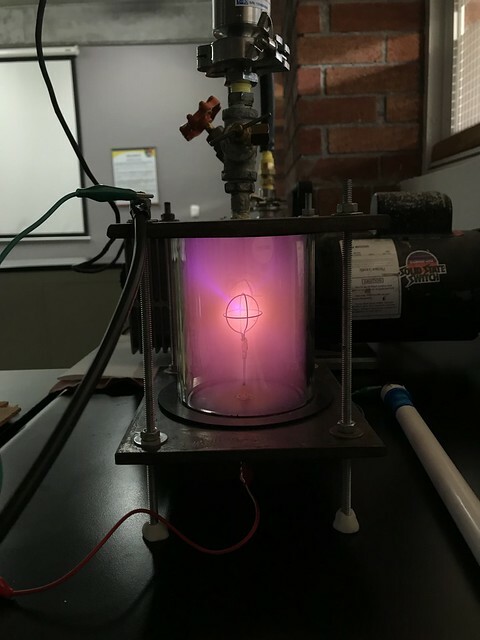 The system was stable and produced an almost bluish and very well confined plasma at around 0.2V (2000v). To confirm my theory I again tested the rectifier without the fusor and maxed it as much as I could with the variac. With 150V input the meter read almost 1V (10,000V) but arcing was going like crazy until the diodes sort of shorted and now my readings were below 0.1V (1000V), even with the 150V input. All this is to say that Rich's reasoning is right: the diodes are subjected to more than 21kV of reverse bias in each AC cycle. 2) diodes in series (as a string)? 3) putting some insulation so the diode is longer (and thus input and output are more separated), hot glue? lab table setup, I really need to get myself a cart or something. 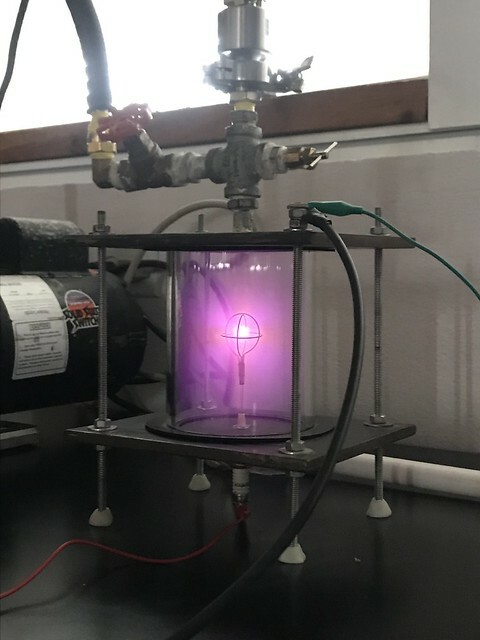 Since you are simply creating a DC plasma (your goal), then the best practice is to ground one terminal of the NST then use the 7.5 kV from the other (I do this with my NST.) The RMS is well under 15 kV now. However, one must remember that air and the diodes' surface can conduct 7.5 kV over the short distance that many diodes offer (and oil/dirt and water vapor absorbed from the air after handling the diodes can reduce that further.) Likely that is what happen. Put your diodes under oil (any synthetic motor oil will work) and that problem should do away. Also, use two diodes in series and the voltage performance is doubled. Try three diodes in series in each leg and get them off of plywood!! Use three insulators and float the strings in air. We assume you have full knowledge of the diode's PIV rating. If 15kv PIV is real with two diodes in series in each leg, they should not have failed. Denis, with your approach I could get 7.5kV just with the HV divider as the load. With the fusor, I couldn't go above 3kV. I tried silicon on the diodes (still on plywood) and the rectifier seems more stable. Still, I won't go over 8kV as arcing starts about there but for 7.5kV it seems to work fine. Richard, what kind of insulators are you referring to? The PIV is supposed o be 15kV according to the spec sheet at the OP. Also, I don't have a current meter so that would be the next step, having a current meter so I can know how much power my NST is delivering. I read your paper but it was a 5kV unit, however, I get the idea that as current increases the voltage output decreases. If I am getting this correctly, the neon transformer only gives nameplate current or nameplate voltage, not both at the same time. However, why does my divider, which would be a load of more than 100megaohms, still read 8,000V? Update: After some more reading now I understand that even a 15kv NST won't deliver 7.5kv DC to any demo fusor. Today I achieved 4kV in the following picture at pressure 50 milliTorr. Is this the maximum I should expect? As in my FAQ or paper on neon xfrmrs, No transformer will deliver its rated voltage and current at the same time. It is not a quantum uncertainty that creeps in, but the design of the transformer. Rich Feldman generated some curves on all of this a while back. Pulling a lot of current will make the voltage available to any load plunge horribly. Plasmas are really controlled heavy loads that want to be flaming electrical arcs. The design of the neon transformer prevents this arcing condition. This is why it is the number one transformer for demo fusors.